← JOHN STAPLETON: Surveillance in Australia; Part Three. JAMES FALLOWS. America Is Fumbling Its Most Important Relationship. The United States has a China problem—and pundits and politicians are making it worse. China is an increasing problem for the United States. But the latest reactions and assumptions about China among America’s political-media leadership class hold every prospect of making China-related problems much worse. How can this be? It involves the familiar tension between short-term political shrewdness and longer-term strategic wisdom. America’s most volatile relationship is with North Korea, for obvious reasons. Its most damaging relationship would seem to be with Russia. Its most dangerously taken-for-granted relationships would be (a four-way tie) with Mexico, Canada, the European Union as an economic group, and NATO as a strategic alliance. Each of these relationships is crucial to America’s long-term economic, diplomatic, military, and national-security well-being. All are now under more-or-less acute strain, based on each group’s calculation on how long Trump-style erratic “America First!”-ism will guide U.S. actions. Its most subject-to-change relationships are, for a widely varying range of reasons, with Saudi Arabia, with Iran, with Israel, with Pakistan, with Turkey, with Australia, with South Korea, with the Philippines, with half a dozen others I can think of. But its most important relationship, beyond any reasonable dispute—“bar none,” you might say—is with China. No other country has the prospect of eventually having a larger economy than America’s—which sooner or later China will inevitably do. (With four times as many people, it need only become one-quarter as rich as the United States per capita to take the lead.) No other nation outside North America is as tightly integrated with U.S. corporate production, consumption, distribution, and marketing systems. While Russia still has many more nuclear weapons, no other country could even dream of becoming an across-the-board military rival to the United States, as China might. Handled right—or, in as error-minimizing a way as the governments of both countries more or less have handled it over the past four decades—this is a relationship that overall can be a force for greater prosperity, less environmental damage, and more diplomatic stability around the world. Handled wrong, it holds peril for everyone, in realms ranging from an accelerated arms race in Asia to hastened environmental disaster for the world as a whole.I’ve never fully signed on to the “Thucydides Trap” predictions for the U.S. and China—essentially, the idea that if a rising power and an established power each believe that they are destined for a showdown, then that conflict is very likely to occur. (I haven’t signed on because there are so many buffers working against something like the Thucydides-type German-British collision that led to World War I. Despite their regional rivalries, China and the U.S. are in different parts of the world, with the whole Pacific Ocean between them. They’re not involved in the kind of direct colonial competition that England and Germany were. The gap between the two sides’ military power is much greater, though both are nuclear-armed and thus warier of direct confrontation; and so on.) But I’ve believed in the converse of the Thucydides concept: that the assumption from both governments that they could peacefully manage China’s rise has made conflict less rather than more likely. Just before the 2016 election, I finished a piece about the Chinese side of this predicament, and why handling China would be a bigger problem for whoever became the 45th U.S. president than it had been for U.S. presidents from number 39 through 44, Carter through Obama. The piece was called “China’s Great Leap Backward,” and its premise was that internal changes in China would require a reconsideration of China policy by an administration led by either Hillary Clinton or Donald Trump. Those changes coincided with the shift in control, beginning five years ago, from the colorless Chinese leader Hu Jintao to the current strongman Xi Jinping. By the time of the 2016 U.S. presidential election, signs of change were mounting: Xi’s concentration of personal power, his crackdown on dissent in any form, his reversal of the slow but obvious trend toward gradual social and civic liberalization. No reasonable outsider should ever have expected that bringing Communist China into the world economy would convert it into a Western-style liberal democracy. But through the first few decades of this process, economic integration with the world made China undeniably less controlled and repressive, not to mention dramatically richer. Year by year from the late 1970s until about 2015, daily life throughout China became steadily less regimented and totalitarian, more internationalized and diverse. In huge areas of Chinese life, the government can still seem a far-off presence, with free-wheeling chaos more noticeable than tight control. The paradoxical combination of insecurity and aggressiveness is hardly confined to China. The United States has all too many examples in its own politics. 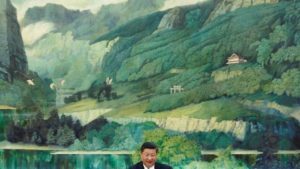 But this paradox on a national-strategic scale for China matched what many people told me about Xi himself as a leader: The more uncertain he feels about China’s diplomatic and economic position in the world, and the more grumbling he hears about his ongoing crackdown, the more “decisively” he is likely to act. The factor added since then is the Chinese leadership’s sizing up of Donald Trump. They appear to view him as someone they can flatter (with a lavish welcome in Beijing, and the pretense that Xi Jinping is Trump’s “close friend”), can out-bargain (as with Farm Belt tariffs aimed straight at Trump’s political base), and can potentially buy off (as with a recent deal favoring a Trump property in Indonesia). Meanwhile come a range of other provocations or challenges, from a U.S. perspective: the steadily mounting national preferences of China’s “Buy Chinese” program to advance its high-tech industries. The relentless fortification of reefs and islands in the surrounding seas. The efforts to muscle foreign companies into compliance with Chinese political-correctness standards—for instance, just this year, shutting down the websites of Marriott (among other companies) and demanding a formal apology (which Marriott gave), for online maps listing Taiwan and Tibet as “countries,” rather than the integral parts of the People’s Republic that the Chinese government considers them to be. Apart from these heavy-handed political moves, China’s heavy investments in machine-learning and artificial intelligence (AI) technologies are likely to pay off more fully than some of its previous high-tech ambitions. Its worldwide infrastructure projects, under the oddly named “One Belt, One Road” world-trade plan, are creating corruption-related friction in some parts of the world (as illustrated by this report from Malaysia) but inevitably expand the reach of Chinese businesses. (Why the name, which in English sounds odd? The “road” of the One Belt-One Road strategy actually refers to sea lanes linking China with ports around the world.) In the diplomatic and trade-policy vacuum created by the recent U.S. “America First!” withdrawal from the Paris climate accords, the Trans-Pacific Partnership and other trade deals, and the previous emphasis on active ties with South Korea and Japan, China has realized it has surprising new freedom of action. You don’t need the CIA, or deep study in Chinese history, to understand the grand design. President Xi Jinping has laid a lot of it out for all to see. Made in China’s 2025: The plan is to dominate all futuristic advanced technologies such as robotics, AI, aviation and space, driverless or new energy vehicles. Be smart: Trump showed you can turn China into a villain on trade. But a smart politician could turn China into a unifying villain on virtually every topic—a reason to move fast and together on infrastructure, immigration, regulations, space, robotics, 5G and next-gen education. In Axios articles, “be smart” is of course a political pro’s term of art. It means “Stay ahead of the crowd,” or “here’s a smart take!” But in my opinion it would be really dumb to let this become the hot new take on China. If China gets turned into a “unifying villain on virtually every topic,” the U.S. is almost certain to get less of what it hopes for, and more of what it fears, from the leaders in Beijing. In the long history of China’s dealings with the outside world, I’m not aware of even a single case in which public condemnation by foreigners, or shaming, or ginned-up ill will, has persuaded Chinese leadership to knuckle under to foreign demands. On the contrary: If you want to see the worst and least cooperative side of Chinese leadership, give them a set of in-public ultimatums, and demand that they comply. No government likes to be seen as bowing to foreign pressure—and China’s government likes it even less than most, and likes it less now than at some other times, given the prevailing impression that China is on the rise and that U.S. leadership is in disarray. Establishing the right long-term relationship with China is a genuinely hard problem. Whoever had won the past U.S. election, with whatever set of policies on other issues, would have to deal now with a China that is too big to ignore, too strong to insult, too valuable a potential partner, and too threatening a potential adversary to approach with anything other than a well thought-out plan. The core of such a plan should be trying to shape reality in ways that encourage and discourage various forms of Chinese behavior. The much-loathed Trans-Pacific Partnership, or TPP, was one of those possible shaping tools. The TPP was the rare policy that Donald Trump, Hillary Clinton, and Bernie Sanders all opposed, but its idea was to ally the United States with enough other Pacific Rim trading nations to create a rule-based economic reality too great and influential for China to ignore. Long-term industrial strategies, like the one the Clinton administration applied (successfully) in the early 1990s to revive the U.S. info-tech industry relative to Japan, also can have effect—and can include precisely thought-through tariffs as part of their power. Different times and different details require ever-shifting strategies, but none of them involves “villain” rhetoric or public demands and threats. Nor of course do they involve personal favors or business deals. [In 2015,] when Xi Jinping visited Washington (just after Pope Francis, who drew more press and crowds), Barack Obama is widely believed to have informed him that the United States had had enough on this front. Government-on-government spying and hacking? Sure, that’s normal. But governmental spying on foreign companies, to help their domestic rivals, was different. And if it didn’t stop, the U. S. government would find ways to make life more difficult for Chinese companies. Through use of America’s own formidable tools for cybermeddling? Through impediments to investments? Through shifts in visa policies for influential Chinese families and officials? Obama could leave the means to Xi’s imagination. It wasn’t specific, it wasn’t directly threatening, and it wasn’t public, but Obama’s talk was apparently effective. By most accounts, Chinese military hacking of U.S. corporations has decreased. The hacking decreased. Public shouting and desk-pounding played absolutely no role in a quiet, coordinated, decisive plan to shape the reality within which the Chinese government made its choices. That would be the smart approach. And also, wise. This article was first published by The Atlantic on the 18th of May 2018. James Fallows is a national correspondent for The Atlantic and has written for the magazine since the late 1970s. He has reported extensively from outside the United States and once worked as President Carter’s chief speechwriter. He and his wife, Deborah Fallows, are the authors of the new book Our Towns: A 100,000-Mile Journey Into the Heart of America, which has been a New York Times best-seller and is the basis of a forthcoming HBO documentary.